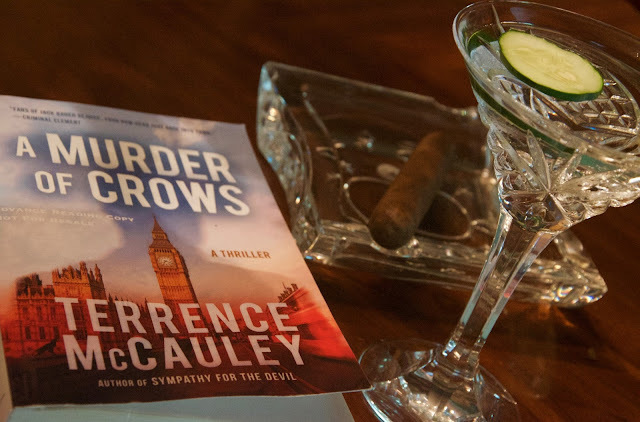 With a cucumber martini in one hand and his new book, A Murder of Crows, in the other Terrence McCauley stops Mystery Playground today to tell us about spies, clandestine groups and a strange new world. First, a little about the book. A MURDER OF CROWS is a sequel to last year’s acclaimed techno-thriller SYMPATHY FOR THE DEVIL. For years, every intelligence agency in the world has been chasing the elusive terrorist known only as The Moroccan. But when James Hicks and his clandestine group known as the University thwart a bio-terror attack against New York City and capture The Moroccan, they find themselves in the crosshairs of their own intelligence community. The CIA, NSA, DIA and the Mossad are still hunting for The Moroccan and will stop at nothing to get him. Hicks must find a way to keep the other agencies at bay while he tries to break the terrorist and uncover what else he is planning. When he ultimately surrenders information that leads to the most wanted terrorist in the world, Hicks and his team find themselves in a strange new world where allies become enemies, enemies become allies and the fate of the University - perhaps even the Western world - may hang in the balance. In the novels, Hicks prefers to drink Laphroaig, but since that isn’t really a recipe, I had to come up with a drink that reflects the overall mood of the novels. Since Hicks is a character who easily fit in wherever he goes, I wanted a fairly common cocktail that possessed rare elements one might not expect. Something relatable yet unique. That’s why I picked a Hendricks Cucumber Martini. It’s a drink that’s enjoyable in all types of weather and in almost any situation, though I always enjoyed it best in summer. 1.In a cocktail shaker, muddle the cucumber with a squeeze of lemon. 2.Add gin and elderflower liqueur with ice. 3.Shake and strain into a chilled martini glass. 4.Garnish with a slice of cucumber. I love the title of this book! I think a martini sounds wonderful especially a cucumber one.